Here is the third card in our series from the May Card Class. Again, this would make a great graduation card. 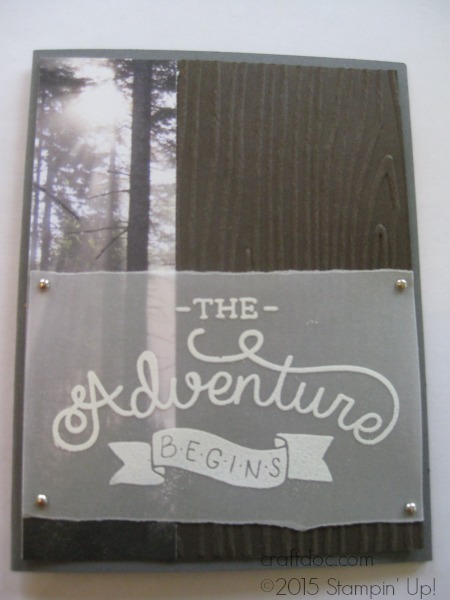 -Tear a piece of Vellum Cardstock and use White Embossing powder and the Adventure Awaits stamp set (RETIRING THIS MONTH). -Attach 2 panels to a scrap panel that is 4″ by 5-1/4″. Here I used a 1-1/2″ piece of Adventure Bound DSP (also retiring) and a 2-1/2″ piece of Early Espresso cardstock, run through the Big Shot with the woodgrain embossing folder. -Now you can attach the vellum with the silver mini brads and the back will be hidden when you adhere the panel to the card base – Here Basic Gray. All supplies are by Stampin’ Up! and can be purchased at my website SHOP.